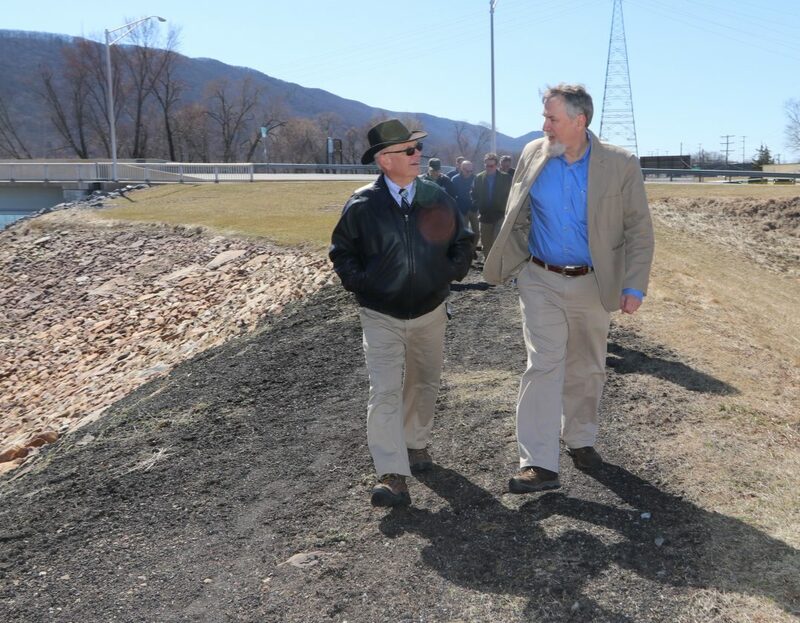 KAREN VIBERT-KENNEDY/Sun-Gazette Jerry Walls, chairman, board of directors Susquehanna Greenway Partnership, left, and John Norbert, PA DCNR deputy secretary for Parks and Forestry, right, walk near Susquehanna State Park to see where the where the Susquehanna Riverwalk will be extended. The 2.4 mile, paved extension plans to connect the current river walk to Susquehanna State Park through the city and close to both Lycoming College and Penn College. Mark Murawski, Lycoming County transportation planner, said the estimated costs to complete the project are around $500,000. community partnership grant to secure the design, which was matched with an Act 13 legacy fund, he said. John Norbeck, deputy secretary for Parks and Forestry at the DCNR, said Governor Tom Wolf’s Restore Pennsylvania proposal would bring $4.5 billion through a severance tax to fund projects such as the extension. Representatives from Pennsylvania College of Technology, River Valley Transit and county governmental officials were in attendance for the talk, which concluded with a tour of the proposed land to be developed. The proposed money would come from in through the form of state bonds, and would be paid out in four equal amounts over 4 years, he said. operating in Pennsylvania and the rate would be tied to natural gas prices. “We think it will be a great way to reinvest in Pennsylvania to do some really good stuff for our citizens,” said Norbeck. Restore Pennsylvania also will fund state, county and municipal parks, infrastructure and trail connections, much like Susquehanna River Walk plans to do in the future. Included in the infrastructure are plans to make broadband internet available throughout the state, which, according to Norbeck, will allow businesses to move to more rural areas. Patrick Marty, chief of staff and assistant to the president for college relations at Penn College, said the proposed extension would add an important element to attracting both potential students and professionals. Large organizations such as UPMC Susquehanna and Lycoming Engines also use Williamsport’s connection to the outdoors to attract talent, he said. directors for susquehanna Greenway partnership, said the colleges would benefit from having a pathway students could walk or bike to each campus. “I think that interconnectivity, of those two college campuses fosters the kind of atmosphere where students can take advantage of specialty courses in each campus without the difficulty of not making scheduled classes because they can’t get from one place to the other sooner,” he said. Currently, the two colleges don’t compete with each other due to their separate educational focuses. This could lead to increased partnership, Lycoming College being a liberal arts school, and Penn College, being a technical school.